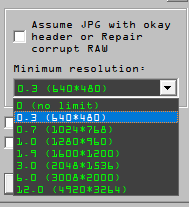 JPG-Repair is now also capable of processing corrupt RAW photos. A RAW photo is the raw sensor data from the (mostly DSLR and system) cameras and is fundamentally different from JPEG. You can regard the RAW photo the negative that needs to be developed. The JPEG is the developed photograph. 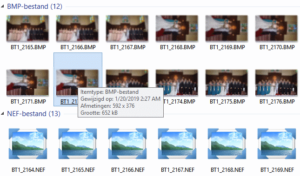 Most cameras that produce RAW files also automatically ‘develop’ the raw data and embed that into the RAW file in the form of complete JPEGs (often more than one: most NEF files I have come across embed a thumbnail, medium size preview and full size preview). 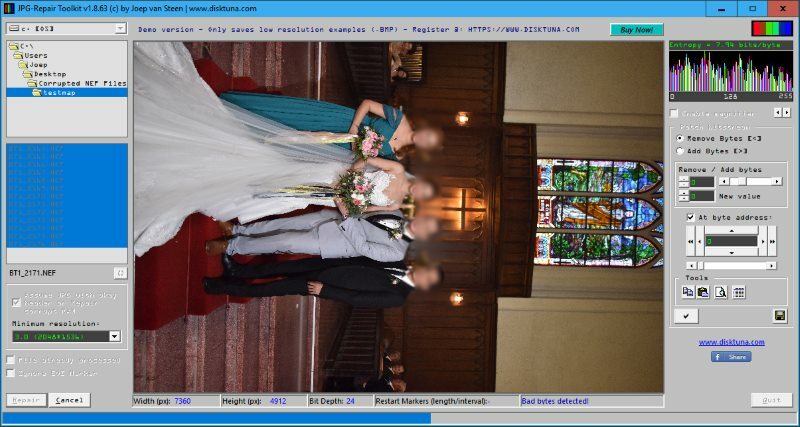 As JPG-Repair already had routines on board to parse JPEGs, this functionality can also be used to extract JPEG data from even corrupt RAW photos. Even if the RAW file is beyond repair, it may be useful to at least have the JPEG data from the file. If your format isn’t listed please send me a few intact samples so I can add support for it. 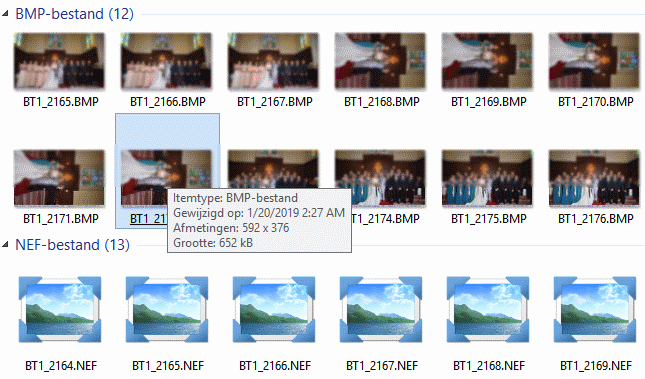 For example, 640 x 480 skips 160 x 120 thumbnails and grabs the first next JPEG that is larger. Assume this is a 1620 x 1080 format JPEG it will save that. However, if further on the RAW file embeds a 7360 x 4912 JPEG, you’ll miss that. So, to skip the first two smaller files set minimum resolution to 3.0 mega pixels (2048 x 1536). So, per ‘run’, JPG Repair extracts ONE file per RAW photo. You can still process multiple files in batch. JPG-Repair shows previews and automatically saves the files to the source folder.